Milton "Chris" Christian receives a belated Bronze Star from Sen. Jeanne Shaheen. DERRY – For most of his 84 years, Milton “Just call me Chris” Christian has avoided the limelight. Yesterday, all eyes were on him, as the World War II combat veteran finally received the Bronze Star that, for decades, had eluded him. “I feel like a deer in the headlights,” said Christian, somewhere between the fanfare and the flurry of photographs, snapped for posterity by his fleet of children and grandchildren, gathered together from near and far for the 20-minute ceremony held in the third-floor town council chambers. 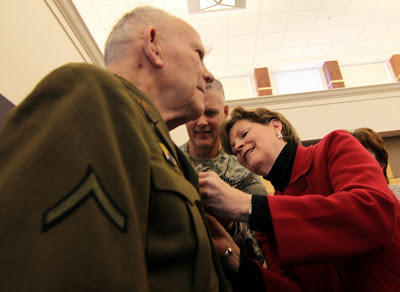 Sen. Jean Shaheen did the honors, working with Col. James Moody to pin the medal to the breast pocket of Christian's vintage Army field jacket, which he dusts off for special occasions. The senator said it was only her second opportunity to present a belated medal to a WWII veteran. “Ouch,” said Christian, after one of several failed attempts by the two to poke through the thick woolen pocket flap. “It's like getting wounded in the service. You always hope the person working on you has experience,” said Christian, in jest, allowing his trademark good humor to shine. Like many of those who served in WWII, Christian had earned the medal for “heroic service” but never received it, explained Shaheen – commanders did not always know the criteria for the award, which originated in 1944. Christian had read about another veteran who received the medal, and started asking around. Shaheen's office finally did the leg work required, which included verifying Christian's military service records, after his own copies had been lost in a fire. 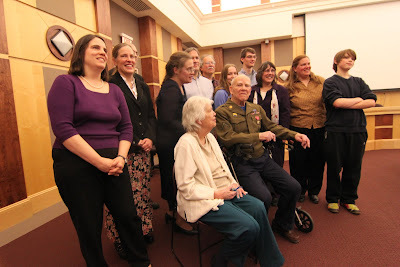 From 1943 to 1946 Christian served as a machine gunner with the 29th Infantry Division. He doesn't consider himself a hero, although his collection of medals tells another story – Purple Heart, Good Conduct Medal, European-African Middle Eastern Campaign medal, Victory Medal, Combat Infantryman Badge 1st Award, Honorable Service Lapel Button, Marskman Badge – ribbons he says he earned simply doing his job, protecting his fellow soldiers. Christian returned from the war and resumed his education at UNH, setting the course of the rest of his fortunate life. He was a 25-year-old grad student when he met his match – a 17-year-old first-year freshman named Charlotte. They married before her junior year, and started a family almost immediately. In 1957 Christian and his bride settled in a stately home on East Broadway with their burgeoning family and went on to raise seven children – Steve, Bill, Pat, Nancy, twins Alice and Amy, and Marge. Christian's daughter dabs her eyes. Yesterday's ceremony brought several of the kids to tears, as their father soaked in the applause then made his way to the podium using a walker. He mentioned one of his war buddies, who is still living in Texas. “He deserves this as much as I do. If it wasn't for the both of us, neither of us would be here – and none of these kids would be here. It took the two of us to get things done,” Christian said. Christian downed the bubbly and savored his french fries and jumbo bacon burger. 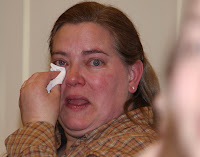 Between bites, he talked about how the war had changed him. “Some things you forget; other things stay with you and you replay them over and over again in your mind, like it was yesterday,” he said, closing his eyes. “They say there are no atheists in foxholes. But as we sat in those holes, praying that God would save us, I thought about the fact that the other side was doing the same thing. And then I wondered if God is just playing some kind of game with us. Pretty much I decided at that point there was no god,” Christian said.